Last night we had a celebratory evening at Lorna’s cabin on the Search and Rescue site in the back of Yosemite’s Camp 4. It was our first night down after spending three nights climbing Lurking Fear, so we cooked up a big dinner and invited a few friends over for glasses of wine. For an appetizer, Kate brought dark red heirloom tomatoes from Placerville, which we topped with coarse ground Himalayan sea salt. 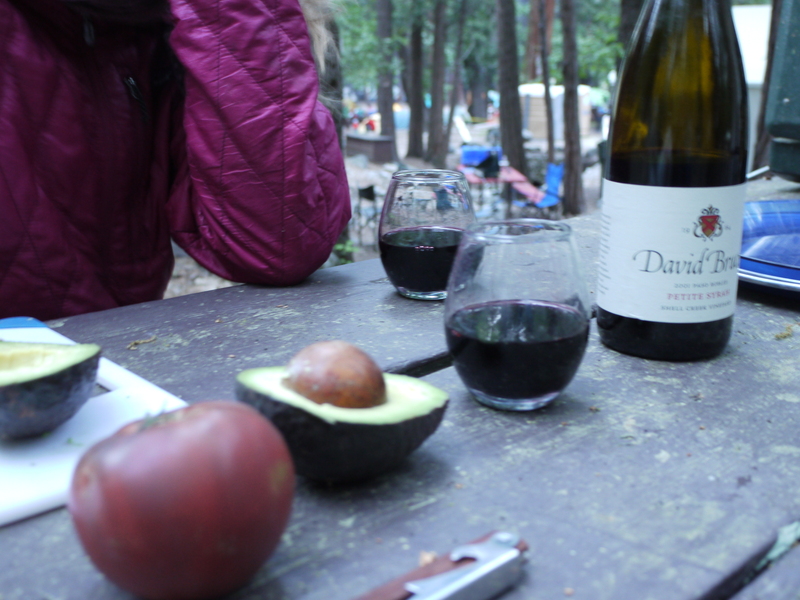 We opened a bottle of 2001 David Bruce Petite Syrah from the Shell Creek Vineyard near Paso Robles, California, and were wonderfully surprised by its depth of flavor. We savored its balance of lightness and fruit. Dinner was black bean, chicken sausage and green chile burritos wrapped in seven-grain tortillas and topped with avocado, sharp cheddar and salsa. It felt wonderful to eat real food after three days of cold wall dinners. Bozeman women, Meredith and Esther, stopped by and told us about getting chased off the ground the previous day while they were starting up the classic route, Nutcracker, a five-pitch 5.8. For their tale, we popped open a second bottle: a 2005 Kenneth Volk Merlot, another from the San Francisco Wine Exchange. Esther told us she was mid-lead on the first pitch, and Meredith was belaying from the ground. The bear made several passes at Meredith (I can’t blame him, she’s beautiful), so she grabbed their pack and ran up the first 50 feet of the route in her flip flops, all while keeping Esther on belay. The Merlot grew on us as we tried it, its body opening more with each sip. Althea and Libby stopped by, just back from Search and Rescue training in the Tuolumne high country. They told us the picnic tables at 8000’ were still buried under snow, but the ice on Tenaya Lake was almost completely melted. Finally, Kate’s aunt Katie sat down with us late night (9:30). Katie talked a bit about Alaska, where their family spends time, and asked me about Montana and our last winter. Winter in Montana… it was 40 degrees there this week. I’m so glad I spent this week in Yosemite climbing in perfect weather with strong, fun women on golden El Cap granite. We even discovered a couple new favorite wines. The San Francisco Wine Exchange also distributes lovely, affordable wines from Milbrandt and Arido varieties from Washington state and Argentina. I grew up in Vermont and live in Bozeman, Montana. I love topography: mountains, rocks, weather and people. I just came across your blog, and I have really enjoyed what I have read so far. Something in this specific post caught my attention because it’s a question Bre, Pete, Suzanne, (wife, uncle and aunt on my mother’s side) and I were were wrestling with earlier today, that is, how do the Himalayas have sea salt? The best answer we could come up with was that the salt was formed and deposited a long time ago when, perhaps, a sea existed somewhere in the vincinty of the range. None of us are geologists, so this was really a shot in the dark. I’m curious if you have any thoughts on the matter. I hope all is well with you, and judging from your entries here, things seem well and then some. keep up the good work, and give my best to the rest of the Vermont Stiflers – I hope we can all catch up soon. Whatever happened to the 50th anniversary of the Stiflers on Isle au Haut celebration anyway? One theory has it that the huge salt deposit in Pakistan was formed when the Indian Continent collided into the Asian continent. The large body of salt water there became an inland sea and eventually dried up. This salt mine is one of the world’s largest.